53.A man sold an article for Rs. 450, after allowing a discount of 16 2/3 % on the printed price. What is that printed price? 56. P's salary is 25% higher than Q, what percentage is Q's salary lower than that of P? 57.A and B start running at the same time and from the same point around a circle. If A can complete one round in 40 seconds and B in50 seconds, how many seconds will they take to reach the starting point simultaneously? The pie-chart shows Distribution of Special Children Population during the year 1994-96. Study the pie-chart and answer the following questions. 72. Find the approximate percentage distribution of children with auditory disorder. 73. What is the average number of cases in different types of special children during the year 1994-96. 74. Find the ratio between articulatory disorder and speech disorder cases. 75. 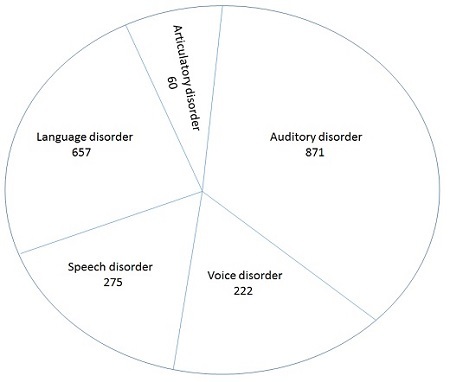 What is the ratio between language disorder and the average of the remaining disorder cases. 76.In the following question, out of the four alternatives, choose the word which best expresses the meaning of the given word and click the button corresponding to it. 79. In the following questions, one part of the sentence may have an error. Find out which part of the sentence has an error and click the button corresponding to it. If the sentence is free from error, click the "No error" option. 80. In the following questions, one part of the sentence may have an error. Find out which part of the sentence has an error and click the button corresponding to it. If the sentence is free from error, click the "No error" option. 81. In the following questions, one part of the sentence may have an error. Find out which part of the sentence has an error and click the button corresponding to it. If the sentence is free from error, click the "No error" option. One who studies the working of the human mind. 91. A sentence/a part of the sentence is underlined. Four alternatives are given to the underlined part which will improve the sentence. Choose the correct alternative and click the button corresponding to it. In case no improvement is needed, click the button corresponding to "No improvement". 1) that he bought yesterday. 92. A sentence/a part of the sentence is underlined. Four alternatives are given to the underlined part which will improve the sentence. Choose the correct alternative and click the button corresponding to it. In case no improvement is needed, click the button corresponding to "No improvement". 93. A sentence/a part of the sentence is underlined. Four alternatives are given to the underlined part which will improve the sentence. Choose the correct alternative and click the button corresponding to it. In case no improvement is needed, click the button corresponding to "No improvement". 94. A sentence/a part of the sentence is underlined. Four alternatives are given to the underlined part which will improve the sentence. Choose the correct alternative and click the button corresponding to it. In case no improvement is needed, click the button corresponding to "No improvement". 95. A sentence/a part of the sentence is underlined. Four alternatives are given to the underlined part which will improve the sentence. Choose the correct alternative and click the button corresponding to it. In case no improvement is needed, click the button corresponding to "No improvement". He waited a moment in surprise, wondering why she did not come nearer, and then, maddened by hunger, he dived at the fish. With a loud scream he fell outwards and downwards into space. His mother had soared upwards. As he passed beneath her, he heard the swish of her wings. Then a monstrous terror seized him and his heart stood still. He could hear nothing. But it only lasted a moment. The next moment, he felt his wings spread outwards. The wind rushed against his breast feathers, then under his stomach and against his wings. He could feel the tips of his wings cutting through the air. He was not falling headlong now. He was soaring gradually downwards and outwards. He was no longer afraid. He just felt a bit dizzy. Then, he flapped his wings once and he soared upwards. he uttered a joyous scream and flapped them again. He soared higher. He raised his breast and banked against the wind. His mother swooped past him, her wings making a loud noise. He answered her with another scream. 100. What did the young seagull do when his mother swooped past him?